It's not cheap, but from superb audio quality to the strong design and exemplary comfort, the Beyerdynamic Custom Game is a suitably high-end gaming headset. With strong budget-friendly gaming headsets popping up en masse of late, a pricier stereo headset had better be at the top of its game if it's asking for significant cash. Luckily, the Beyerdynamic Custom Game headset is up to the task. The over-ear headset sticks to the design tenets of other Beyerdynamic options from the last few years, such as the nearly-identical Custom One Pro Plus headphones, and similarly keeps the focus on a durable build, serious comfort, and crisp sound. Whether it's really worth spending $209 (£179, AU$249) on is your call to make; you can get a very good gaming headset at less than half that price. But if you don't mind investing in a polished and well-built device, the Beyerdynamic Custom Game certainly impresses. 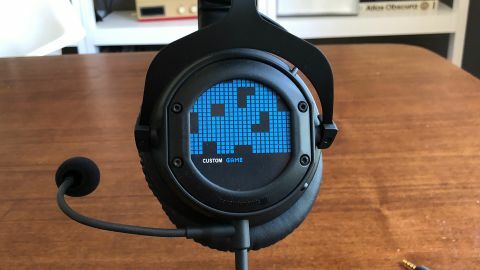 Unlike a lot of gaming headsets, the Beyerdynamic Custom Game feels like it was built for audiophiles and then affixed with a microphone for gaming purposes. And that quite literally seems to be the case, since the headset looks exactly like other over-ear cans in the company's Custom family. In my view, that's a very good thing. It doesn't have a lot of tacky, cheap-looking plastic or color accents in the mix; at a glance, this headset looks like it means business. The Custom Game feels like it was built for both durability and comfort, it excels on both counts. The headband consists of flexible metal strips wrapped in a seriously plush, removable cover. Paired with the large, pillowy-soft cans, the Beyerdynamic Custom Game is a pleasure to have on your head. It nicely envelops your ears and blocks a lot of external noise, keeping you focused on your game—and it holds up well across long sessions, too. The angled metal arches that connect the band to the cans feel suitably tough, although I don't love the feeling of adjusting them. It works just fine and holds to your preferred setting, but one of the sides on my review unit makes an unpleasant metal-on-metal scraping sound upon adjustment. Like some other Beyerdynamic headphones, you can swap in a handful of different design covers on each can. It's an easy process, but unlike the headset itself, some of the cover options are obnoxious, aggressively gamer-centric tags that I couldn't bear to be seen wearing. It's a strange juxtaposition, considering the look of the actual headset. Thankfully, a couple of the designs aren't embarrassing. Another familiar Beyerdynamic feature carried over to the Custom Game is the physical bass slider, which lets you swap between different bass profiles on each can – more on that in the next section. The adjustable microphone is attached to the removable 3.5mm cord that plugs into the headset, and has an in-line volume and mute control about one foot down. Unfortunately, having the boom-style mic built into the included cord means you'll need to track down your own plain 3.5mm cord if you want to use the Custom Game as headphones without the mic in view. What do you get with a $200+ gaming headset? While you don't get virtual surround sound with the Beyerdynamic Custom Game, it does sound really sharp with pure stereo output. The familiar 3.5mm jack means you can plug the Custom Game into a PC, PlayStation 4, Xbox One, Nintendo Switch, smartphone, tablet, or pretty much anything else – and it impresses no matter what kind of source I try. Whether gaming, listening to music, or watching movies, I feel immersed and enraptured by the playback. Every axe impact and guttural shout in God of War resonates with the kind of bold thump I expect, thanks to the Custom Game's broad soundstage and seriously well-defined output. Shifting over to Rocket League, the bouncy electronic soundtrack never comes across as muddled, and every goal explosion resonates with a booming, crystal-clear blast. The bass sliders might seem like a gimmick; after all, how can a few clicks from these little plastic nubs really change anything? Amazingly, they make a real difference. On one end, the bass is a bit neutral and the headphones feel more closed off – but if you want a stronger bass kick, you can open them up and savor the thump. And it's never overwhelming at the highest level, but it's a nice addition for when you want it. While the microphone's placement can be a bit inconvenient for regular listening, the cardioid condenser mic itself is truly excellent. It captures your voice with a richness and clarity that's just a step ahead of what I've heard from other gaming headsets in the past. Not everyone needs to spend $200+ on a gaming headset. In fact, we'd say that very few people would probably appreciate the aural nuances and build/comfort improvements enough to drop that much on a set of gaming cans. But for the money, the Beyerdynamic Custom Game seriously delivers. From dynamic stereo sound to unparalleled comfort, a confidence-inspiring build, and a stellar mic, this high-end gaming headset carries on Beyerdynamic's legacy in the gaming space.